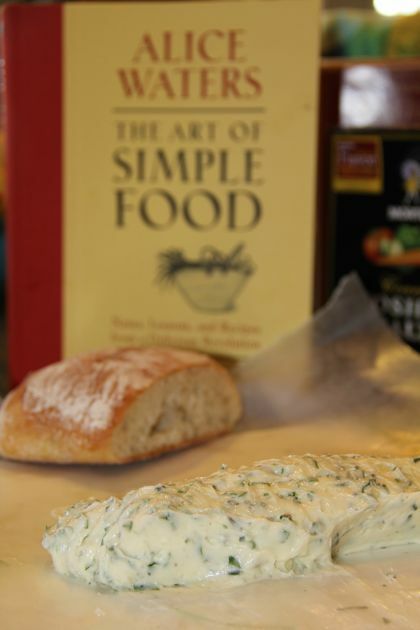 We are rolling through the four sauces, in our book~cook club for The Art of Simple Food! This morning I pulled out some butter, to soften, for making herb butter. It's oh-so much cooler, by ten degrees, which makes me very happy about cooking and eating. I was sort of stalling on this particular recipe, because it sounds so rich and savory, something for a real fall meal. Okay. Thank you. Weather talk is over. 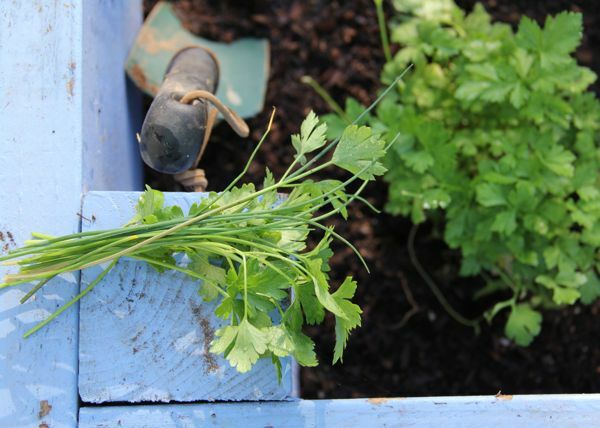 Since Alice Waters encourages us to eat locally, fresh, organic, sustainable... sensibly, I was particularly inspired when it came time to replant our garden beds. Besides looking for cool season crops, I added more herbs, in anticipation of the four sauces Alice Waters calls essential. 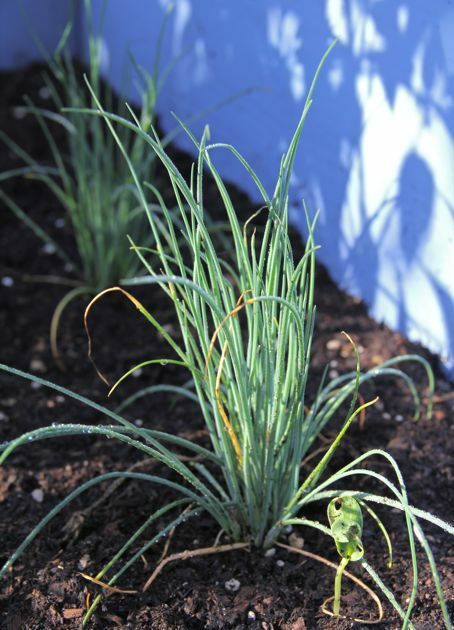 I planted chives, and flat leaf parsley, and French Tarragon. I've never planted Tarragon. Took a nibble this morning. Guess what... tastes a bit like black licorice. Not a fan. Pretty little herb, though. We also have chiles, still going strong, and we put in lots of basil, and some lettuce varieties. I digress. First weather, now the garden... or is this really a digression? Food and weather, and gardens they are totally connected. I am actually totally on topic! Excellent. 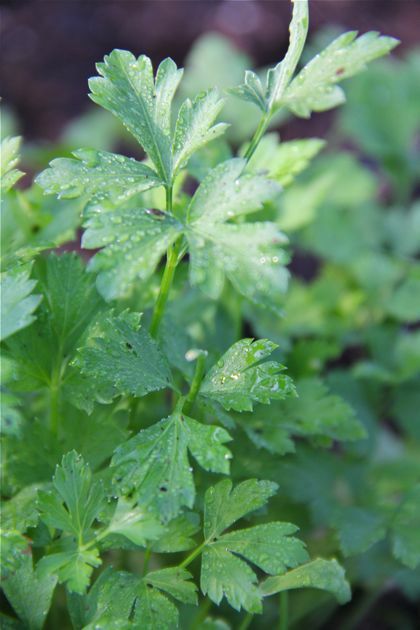 Hello, Parsley. You don't taste like black licorice, do you? One more herb. This one dried, and stored in the barn. Maria will be so thrilled to see that the flowers and herbs we collected and prepared for later use, are already coming in handy. She and I spent several happy summer afternoons, collecting the tiny thyme leaves, and I think they will add a nice note to the herb butter recipe. Have you picked up the book? So far, I think The Art of Simple Food is a worthwhile addition to my kitchen shelf. I mean, even I was able to simply and artfully make real mayonnaise, right from the start. It feels like a field guide. We cook. We know what we like, but Alice Waters is showing us new places, sharing helpful suggestions, inspiring fresh points to view. So, cooking with her cook book feels like touring familiar places, but with a fresh perspective, and being in the cook~book club brings in the companionship and fun of sharing. Using kitchen sheers, I snipped the chives, and parsley. Crumbled in the dry thyme. I minced a garlic clove. I squeezed lemon juice, and sprinkled salt, black pepper, and a smidge of chili powder. And let's face it... we're talking about butter! How could anything possibly go remotely wrong? Everything was mixed together, and I believe I was humming, contentedly. I know I was thinking about the steaks we are grilling this weekend, when my cousin Rebekah comes to visit... cuz, are you catching this? We shall feast, royally well! Yes. I mean, seriously. Yes. I ate this. And it was good. And then I was good, and rolled the herb butter into a log, and wrapped it up in waxed paper, then popped it into the freezer. Herb butter weekend. Nice. Favorite: Remembering the time Maria and I spent together, last summer, collecting thyme and saving it for later. Regrets: Tomorrow isn't Friday. Honestly, I have no regrets. I just can't wait to share the herb butter with the family. Discovered: Tarragon and me, we may never become friends. But. I am willing to keep an open mind. Conclusion: Oh, for goodness sake. What's not to like? It's butter! But the herbs make it something sophisticated, they lend it complexity. 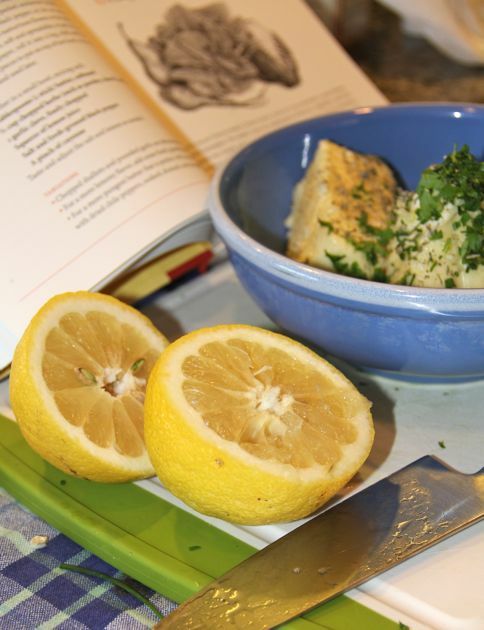 The lemon juice adds a fresh zestiness, light, cheery. I was worried about having too strong of an aftertaste, the way some flavors linger too long, but I don't detect anything like that... the only thing lingering is my desire to enjoy some herbed butter on a baked potato! We have a whole heck of a lot of flavoured butter (various herbs in one kind, and sun-dried tomatoes in the other) left over from the big party, and I'm looking for clever things to do with it. For now it's resting patiently in the freezer. I'm thinking fish steamed in parchment with some of the butter. What would Alice say? Ooooh, I think Alice would say, "May I join you for dinner, please?" I know I would! This looks lovely! I need to set some time aside for the little touches like fancy butter, it always completes a meal! Fancy, yes. But so easy, too. Your photos make everything look SO good. I must get my hands on that book. 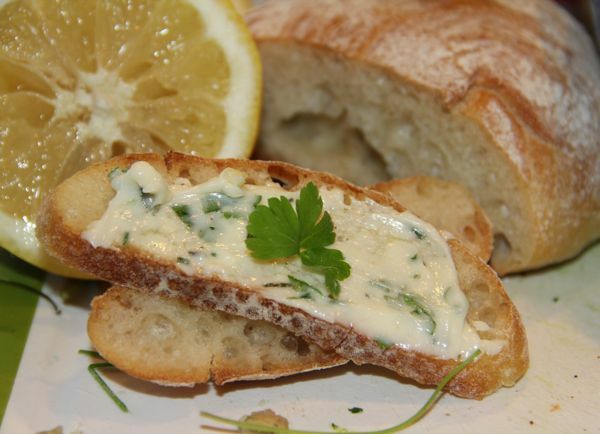 One of our favorite restaurants serves warm bread with the best herb butter. I am going to start making it at home. This is exactly what I was thinking of... a time or two when I've enjoyed something like this in a restaurant. A basket of good bread and butter with something extra special. I hope you will make some, and share your cook~book experiences with us! Thank you for the sweet words about my pictures, Judy. Hi! I love reading about this. I wish my husband was "food adventuresome". If it's not meat and potatoes, forget it!BTW...tarragon is basically what turns hollandaise sauce into bernaise sauce. YUM YUM. Bernaise sauce... another new one for me! So, do you find tarragon has a licorice-y flavor, sort of like anise? Even if your husband is reluctant, try some of these for yourself... herb butter on steak and potatoes... bet it would be hard for anyone to resist! Thanks... I am having a good giggle, now! I will try tarragon cooked... I am sure it will come up in one of her recipes. Salad recipes are coming up, next month. I shall set off immediately to trek to California for a baked potato with herb butter! Don't put the potato in the oven just yet - my journey could take years ... then again, I could bake my own and make my own herb butter! Probably that's the best idea - I'm hungry already! Have fun. So... did you do it? Our herb butter is still in the freezer. And when it's gone, I want to make more, and just always have some on hand. Maybe a variety with berries and a bit of honey?! Yum. I thought anise was licoricey...is tarragon the same stuff? I love licorice so I prob should plant both and see! I think anise is licoricey, too, and the tarragon definitely tasted like black licorice to me. My kids LOVE black licorice. If you grow some, let us know if you agree about the flavor, and then tell us what recipes you use it in. And then invite us all over for dinner~ we'll bring dessert! I feel the same as you do about tarragon. More parsley please! 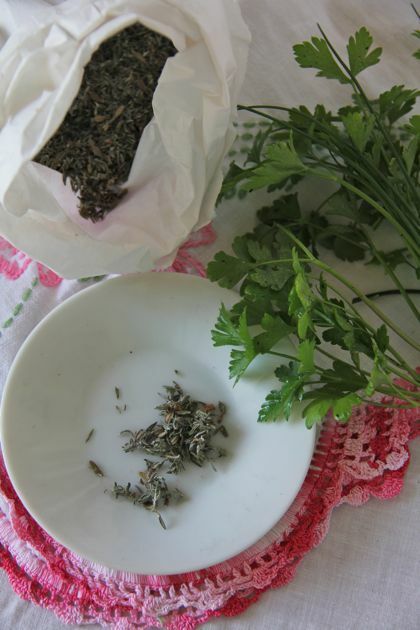 Aren't herbs wonderful? Yes. Yes, they are wonderful. It was so refreshing and bright. What a treat.